CUMBERLAND, Wis. - March 15, 2016 - PRLog -- Today more than ever, people are looking for products they can trust. When it comes to food…people are taking their time looking for pure food and ingredients like never before. Introducing, Anderson's Pure Maple Syrup that provides all natural products. 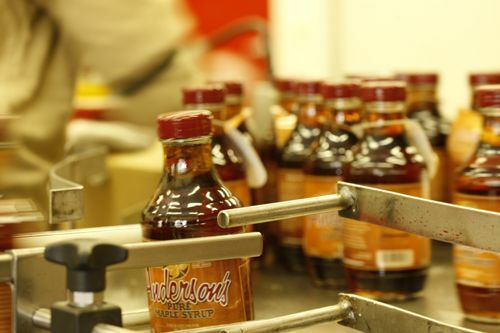 Anderson's Pure Maple Syrup was created in 1928 when Paul Anderson shared his pure maple syrup with family and friends. Now, nearly four generations later, they continue this family heritage by tapping sugar maple trees on the very sugarbush their grandfather tapped years ago. The tapping season is now and the sap is flowing to make great quality pure maple syrup. "It's always a good sign when the saw dust is coming out wet...that means that the sap is running. We take our spout and hammer it in the tree...and tap it in, so, it's nice and snug and it starts dripping almost immediately" said Steven Anderson, Of Anderson's Pure Maple Syrup. The process of making syrup is a treat to see just as the finished product is a treat to eat. You can see the video here and get ready to want some!